View incoming, existing & past orders. 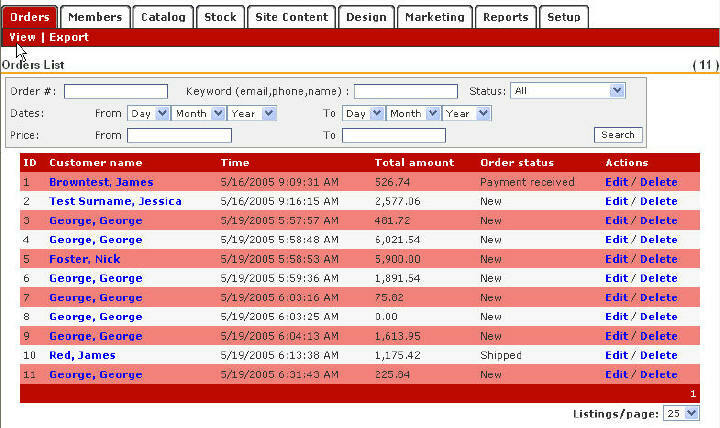 View Customer details such as order history, payment details and feedback. Edit & delete order information. Send e-mail notifications to Customers about order status. Perform an order on your storefront. Once you have set up your Magnet E-Commerce store (see e-store Setup section), you will be ready to start receiving and managing your incoming orders. This can all be done from the "Orders" tab of your "Administration Panel". Figure: To view the Orders menu, log into your Magnet account and click on the "Orders" tab in the Administration Panel. Right below the "Orders" tab you will see the "Orders" menu. This menu consists of 2 commands, "View" and Export". By clicking the "Orders" tab the contents of "View" will appear by default. Figure: Clicking "Orders > View" in the Administration panel will allow you to see a list of all your "Orders"
Clicking on the "Export" tab will allow you to receive a .txt file of all your orders via e-mail (the e-mail will be sent to the address you have registered during setup). This txt file can be easily imported into programs such as Microsoft Excel.  Save the .txt file onto your Desktop or in a folder that you can easily find.  Go to File → Open and find the .txt file.  A "Text Import Wizard" will come up and ask you what kind of data you have. Always make sure that you select "Delimited". Click on "Next".  The "Text Import Wizard" will then ask you to choose the delimiters in your document. Select "Tab" and click "Next".  The "Text Import Wizard" will then let you select each column and set the data format for each. You can just select "General" for all. Then click "Next". Figure: The orders export file in Microsoft Excel. Right below the search function, you will see a list of all your new, existing and past orders. This is called your Orders List.
! Each column on the Orders List can be sorted in ascending or descending order, by clicking the title of the column. For example, to sort orders in ascending order by ID. Simply click on "ID". To sort back in ascending order, click on ID again. ID Number: Lists the Order ID number which is automatically given to each order as it comes in. Customer Name: Lists your Customer Name. Names are listed by "Last Name, First, Name". Time: Lists what day/time your orders were received at. Total Amount: Lists the total amount of the order. This total includes taxes and shipping costs. Order Status: Lists the order status. You can update the status of an order by clicking "Edit" in Column 6 . Actions: Shows you "Edit/Delete". By clicking on "Edit" you will be allowed to edit order information. For example, you can change the status of an order from "New" to "Shipped" and you can also see further more specific order attributes like full customer information, payment details, shipping information, etc. You can also Delete an order out of your system by clicking on "Delete".
! When you choose to "Delete" an order, the order information will totally be deleted from the system so make sure you really want to do this. This option is different from setting the order's status to cancelled, in which case the order is still available in the system. To view "Detailed Order Information" from the "Orders List", click the "Edit" link in the "Actions" Column. Figure: To view "Detailed Order Information" for an order click the "Edit" link. At the top of the screen you will see a section titled "Order Information". Figure: Detailed Order Information. Top Screen. B. Order Status and email notification: The "Order Status" tag is changed by selecting the pull-down on the right-hand side. You can set your order status to: "New", "Payment Received", "Shipped", "Completed" or "Cancelled". You also have to option to notify your customer about the order status via email. To do so tick the "Send email notification" check box. The standard content of this email can be defined and edited from "Setup > Texts > E-mail texts" form. Type any additional text for this email in the text box provided. Finally, click the "Submit" button to apply these settings. C. Customer Notes: Feedback received from your Customers. D. Admin Notes: Your notes concerning the order. Click the "Save" button to save your notes.
! When you change the status of an order to "shipped", include the order's tracking number in the additional text field provided for the email.
! You can change the order status keywords ("New", "Payment Received", "Shipped", "Completed" or "Cancelled") from "Setup > Texts > General Texts"
Following the "Order Information" is the "Customer and Shipping Information" section. A. Customer information: IP, First and Last name, Phone number, Company (for corporate orders) and Email. B. Billing Information: Billing Address including City, Country, Zip Code and Continent. C. Company Information: For corporate orders, the company's VAT, Social Security and Industry..
D. Payment Information: Payment method chosen for this order. E. Shipping Information: Full shipping address and phone number. A. Order Details: The product's name (including the variants chosen, e.g. color, service plan etc. ), quantity and price. B. Totals: Full breakdown of the final cost including subtotal, tax and shipping costs.  Step 1: Details : The customer is asked to fill in the billing (and shipping if different) details, reply to any check out questions, provide any additional information, optionally subscribe for the newsletter and select a payment method. Once this is done the "Proceed" button takes her to Step 2.  Step 2: Confirmation : The customer is asked to carefully review the details of her order and click the "Proceed" button if all appears correct or the back button to return to the previous page for corrections. Pressing the "Proceed" button goes on to Step 3.  Step 3: Payment : Details of the selected payment method are provided. If one of the credit card options is selected as a payment method, the customer is automatically transferred to the respective service provider in order to complete this step. All ecommerce transactions take place on the bank servers used by the service providers and we/you do not keep any credit card numbers or private information about customers. Once the order is completed, an email is sent to the customer and the merchant, informing them about the details of the order: products, quantity, price, billing/shipping details and any additional information. The merchant's email(s) used is the one(s) defined in the "Sales email" text box found in the "Setup > General" tab. Figure: Customers can login to your e-store, and track their orders, view their wishlist and edit their account details at any time. To receive and manage your incoming orders go to the Orders menu by clicking the "Orders" tab in the Administration Panel. Click "Orders > View" in the Administration panel to see a list of all your "Orders". Click "Orders > Export" to receive a .txt file of all your orders via e-mail. Use the Search panel to locate specific Orders. All new, existing and past orders are listed under the "Orders List". View "Detailed Order Information" by clicking on the "Customer Name" or "Edit" link in the "Orders List". Change the status of an order and view customer, shipping, product and pricing information through the "Detailed Order Information" page. Customers can login and see past orders, view any items in their wish list and edit their account details. Customers have to go through the following last 3 steps to complete an order: provide their details, confirm the details and proceed to the payment. When an order is placed an email is sent to the customer and the merchant. The merchant's email(s) used is the one(s) defined in the "Setup > General > Sales email" text box.